Get ready for an eternal future that far exceeds what you could ever imagine In Heaven: Better By Far--Answers to Questions About the Believer's Final Hope, author J. Oswald Sanders gets right to the point in addressing frequently asked questions about the place God has prepared for believers. Simply written in a question-and-answer format, this digest of biblical insights addresses more than 25 questions and also challenges several popular notions and myths. Discover how you can be prepared to experience all that God has in store for those who love Him, as you go deeper in your understanding of what the Bible says about . . . - The benefits of death for believers. - The resurrection, rewards, and heavenly occupations. - The Second Advent and judgment. - A new heaven and a New Jerusalem. With its large type, Heaven: Better By Far--Answers to Questions About the Believer's Final Hope has been designed for clear, easy reading. This Easy Print Book takes the struggle out of focusing on small print and is perfect for readers who are visually challenged or dyslexic. Heaven: Better by Far: Answers to Questions about the Believer's Final Hope by Sanders, J. Oswald was published by Discovery House Publishers in May 2013 and is our 63300th best seller. 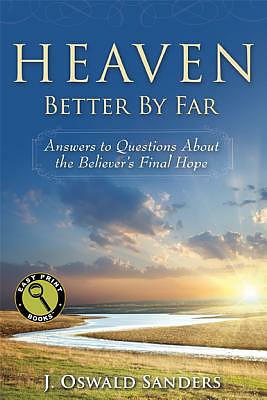 The ISBN for Heaven: Better by Far: Answers to Questions about the Believer's Final Hope is 9781572937567. What of the Unevangelized ? Be the first to review Heaven: Better by Far: Answers to Questions about the Believer's Final Hope! Got a question? No problem! Just click here to ask us about Heaven: Better by Far: Answers to Questions about the Believer's Final Hope.